SANTIAGO, Aug 9 2011 (IPS) - The problems plaguing Chile’s education system are not unknown in the rest of Latin America, but are especially complex in this long, narrow country sandwiched between the Andes mountains and the Pacific ocean. On Tuesday, students and strikers demanding a referendum on education reform set up roadblocks in Santiago, including the central Alameda avenue. Police clamped down harshly on the protests, with water cannon and tear gas. The protests by students demanding educational reforms, a constant feature over the past three months, have the government of rightwing President Sebastián Piñera up against a wall and have surprised those who see Chile as a regional model of economic and political stability. “It has to be understood that the problems in education criticised by the students, such as the segmentation of the system and concerns about quality, are problems not only in this country, but also throughout Latin America,” Daniela Trucco, an expert at the department of social development of the Economic Commission for Latin America and the Caribbean (ECLAC), told IPS. What sets Chile apart from the rest of the region is not questions related to higher education, but the system for financing primary and secondary education. “In most countries the education system is divided into public schools, which are free, and fee-paying private schools. In Chile, though, the system is split into three: the municipal schools run by local governments, that are publicly funded and free; state-subsidised private schools; and private schools that charge tuition,” Trucco said. “It is by far the most complex financing system for education in the region,” said Trucco. The Organic Constitutional Law on Education (LOCE), enacted by the late former dictator Augusto Pinochet (1973-1990) just one day before he stepped down, set off a process of decentralisation and privatisation of education that gave private schools free rein to pursue profit, and use entrance exams to select their students. The government of socialist President Michelle Bachelet (2006-2010) embarked on education reforms to sweep away the deeply unpopular LOCE, in the wake of an unprecedented wave of student demonstrations in 2006. However, political pressures were brought to bear and the modified law passed by Congress in 2009 ultimately failed to dismantle the most unpalatable features of the education system. The social protest movement is now calling for an end to the freedom of private schools receiving state subsidies to levy fees at will. Instead of the current system, under which administrators of these establishments rack up profits, the demonstrators want school fees to be invested in education. Another demand is for public schools at primary and secondary levels to be directly managed by the Education Ministry, instead of by local governments. The LOCE law, which put public schools under the administration of municipal governments, accentuated the inequality in education quality between rich and poor districts. In higher education, “coverage is much lower,” even though public universities are generally tuition-free in Latin America, she said. In spite of the structural problems that plague Chile’s educational system, “it is one of the countries with the highest levels of school coverage and educational quality,” she said. Children in Chile used to attend school either in the morning or the afternoon shifts. But full-time school days were introduced at all primary and secondary schools in 1997. By contrast, “most countries in the region do not have full-time school days, except in fee-paying private primary schools, and this is an enormous factor contributing to inequality, especially as the longer school day is so important for socially disadvantaged children,” Trucco said. According to United Nations agencies, Latin America has very nearly achieved universal primary education, with 95 percent enrolment. But there are still 2.9 million children not in school in the region. On average, 86 percent of children reach the final grade of primary school, while only 67 percent of children enter the education system at the appropriate age. Inequality is still the bane of Chile’s educational system. “What happens when students leave middle school, what opportunities do they have, how do their life outcomes differ, do they go on to higher education, and how do they finance it: these are all problems that are on the agenda for debate, and they are much more complex” in this country, Trucco said. Furthermore, Chile does not have a single university, or even a technical institute, that is completely financed by the state and tuition-free. “Instead of schools and universities fulfilling the promise and expectation of reducing socially-constructed inequalities, what they are doing is reproducing them,” Trucco asserted. This country’s substantial public spending on higher education thus benefits “those who are best off in society, because the less well-off don’t have access to the tertiary education system,” she said, which means this spending is highly “regressive”. In Trucco’s view, public spending on education is not only essential but it should be used to ensure that young people from poor families gain access to higher education and derive benefits from state funding. University and higher education fees are often higher than the national minimum wage, which is around 350 dollars a month. Amid protests, demonstrations and strikes, the government announced on Aug. 1 a set of 21 “policies and action proposals for the development of Chilean education.” These include: writing into the constitution the right to a quality education; reversing the decentralisation of public education to the municipalities; updating teacher training courses and degrees; and reforming the scholarship system and the terms of university student loans. In response, protest organisers called secondary and university students and teachers out on demonstrations Aug. 3, without government permission. The demonstrators were violently dispersed by the police, and over 800 people were arrested nationwide. A night-time “caceroleo” (a protest consisting of noisily banging pots and pans) was then held in many streets in Santiago and other major cities, to protest the police action. “The impression one gets is that the authorities aren’t interested in reaching a negotiated solution; instead of cooling down tempers, they are feeding the flames,” the head of the Observatory of Educational Policies at the University of Chile, Jesús Redondo, told IPS. On Aug. 5 the protest movement leaders officially rejected the government’s 21-point proposal because, they said, the “neoliberal foundations” of the system are being upheld and private education is being perpetuated, without strengthening the public sector. 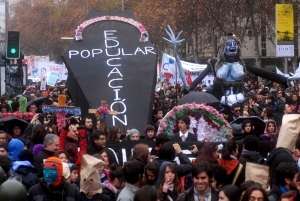 Demonstrators demanding education reform “are participating in a legitimate social movement that has the backing of the people,” said Camila Vallejo, president of the University of Chile Student Federation. The government has not understood, and is reacting “with heavy-handed violence, and is denying people their constitutional rights,” she added. Education is a HUMAN Right. Anything less is a crime against all of us.